Getting Specific: How did people find my story? 1. Next, Jenny clicks on Behavior > Site Content > Landing Pages. 2. Jenny was interested in her story about campaign fraud. She doesn’t find the URL to her story in the top ten, so she goes to the search box at the top of the table and types in the URL. Jenny finds that the article was viewed a lot in the first few days and did indeed contribute to the peak of sessions she saw in that time period. After a few days, it really dropped off. 3. Now that she can see the number of sessions from people who looked at her story, she wants to know how they got there. In many cases, the answers to the most interesting questions involve two different types of reports in Google Analytics. 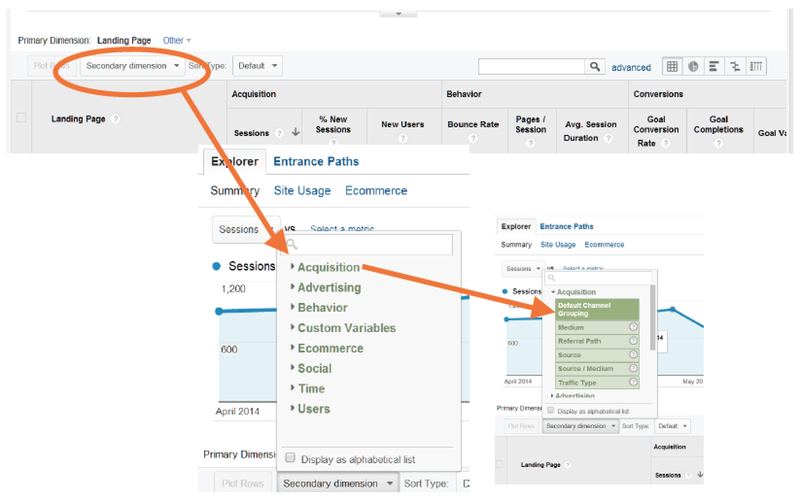 For example, Jenny wants to know how users arrived at the site (Acquisition) for a particular page (Behavior). Fortunately there are several tools for looking at the intersection of these pieces of data. One way Jenny can do it is to add a second set of labels to the rows of the report. Google Analytics calls the labels in the rows of a report “dimensions.” The default dimension depends on the report being viewed. In this case, the dimension is called LANDING PAGES. Right below that, there’s a drop-down to add a secondary dimension, Jenny uses that to add another column with another set of labels. Clicking on the Secondary Dimension drop-down shows a list of possibilities. Now Jenny sees what number and percent of people who landed on the article came from search engines, social media sites and so on. She can click on the pie chart button at the top right of the table for a visual. Jenny finds that the traffic to her campaign fraud story came largely from search engines, with smaller but significant portions from referring sites and social media. In addition, she can compare metrics. One of the metrics in the table is BOUNCE RATE. A “bounce” is when someone comes to the site, views one page and then leaves. Jenny finds it pretty interesting to compare her story to others, looking at which ones drew in the most new users, which ones had the lowest bounce rate and which attracted the most viewers through social media. Jenny’s article, which had an interactive feature, has a really low bounce rate! She’s glad to see that.